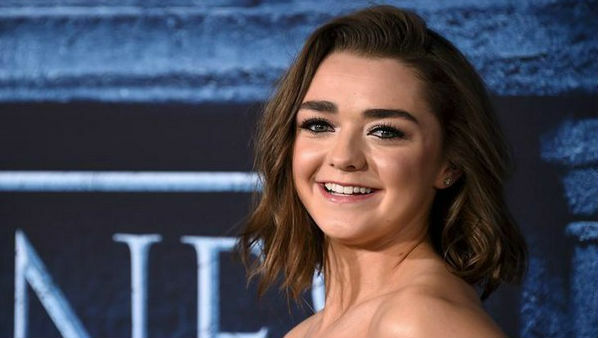 Los Angeles, April 16: "Game of Thrones" star Maisie Williams says she had to wear a strap across her chest to reverse puberty while filming the fantasy series. The actress, 22, has played Arya Stark in the series since she was 11 and explained that growing up on the HBO series has come with its own challenges, reports dailymail.co.uk. The star told the US show "60 Minutes" that when she hit puberty she had to wear an uncomfortable strap to keep her chest flat whilst her character was "pretending to be a boy". Game of Thrones 8: Hilarious Video of Euron Greyjoy Mimicking Shah Rukh Khan’s Iconic ‘Palat, Palat, Palat’ Dialogue to Cersei Lannister Goes Viral. She added: "And then it got to the point where the strap was no longer working. So, I was about 15, right, and he gave me, like, this little, chubby belly. So it would, like, even out the playing field quite. Game of Thrones Season 8 Episode 1 Breaks Records in US With 17.4 Million Viewers. "And then ... yeah, I was about 15 years old. Like, I kinda just want a boyfriend, honestly. I don't wanna wear this. This doesn't feel good." The last season premiered internationally on April 14. It will air in India on Star World on April 16.